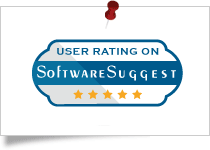 SysTools MBOX Converter Software got 100% secure award with 5 star ratings for its great performance by Software Informer. 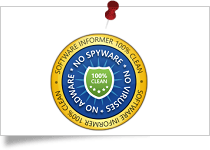 Soft Pedia give 100% clean award to SysTools MBOX Exporter Tool for delivering Virus & Spyware freely. 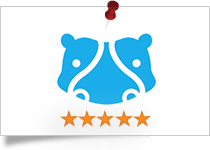 MBOX File Converter tool got 4 star rating from FileHippo for its wonderful performance and effective GUI. Soft32 rate SysTools MBOX converter software with 5 star for its efficiency in exporting Thunderbird Mailbox data easily. SysTools MBOX Migrator is among the highly suggested mbox attachment extractor software for its efficient performance and 5 star rating by its end users. SysTools MBOX Converter software is the ultimate solution to export Mozilla Thunderbird MBOX files in multiple file formats. Its 4.0 version is designed with many new features which provides the users to extract MBOX attachments & transfer their mailbox data in a healthy state. SysTools MBOX Converter Tool is the best MBOX extractor to migrate MBOX files of Thunderbird to Multiple file formats without any data loss. Its features are great & powerfull that allows users to export MBOX Files into respective file formats. This is the easiest way to transfer all MBOX emails and attachments from any MBOX associated email client. Tested for Entourage database, MBOX Migrator performs magnificiently and provides accurate results without any complications. 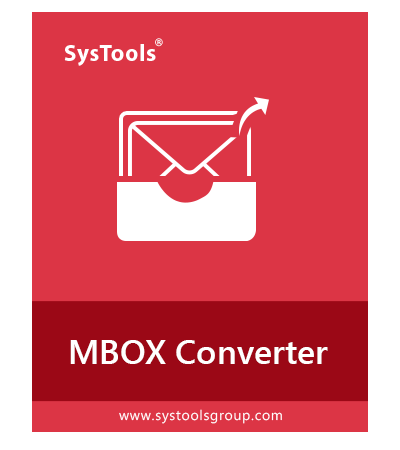 MBOX Converter application by SysTools is among the best softwares developed for Windows platform. It possesses both accuracy and power which enables it to generate results in a profound manner. Considering the variety of features this MBOX export tool has, it surely is worth every penny. With MBOX Migrator application, one can convert multiple MBOX files into file format by selecting two different options that are: File Mode and Folder Mode. Separate files for each MBOX: Using the conventional File Mode to scan data, the software permits users to generate separate files for each MBOX file. Single File for all MBOX: With the Folder Mode option, the tool allows to merge multiple MBOX files into a single file. 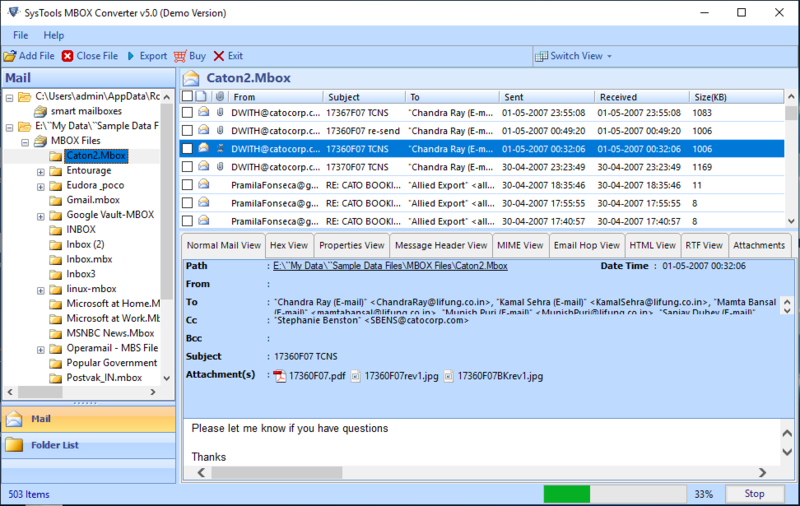 Various Fields associated with MBOX emails are also supported by the MBOX Converter during the conversion process. MBOX Email Header One can easily view and export MBOX email header details such as CC, BCC, Subject, Sent Date, Received Date, Size, and Time. MBOX Email Body The MBOX Exporter is capable to display the message body of MBOX email along with Signature, Inline Image, and Formatting. MBOX Email Attachments The user can preview all types of attachments such as DOCX, ZIP, PDF, PNG, DOCX, JPG. Also, one can preview attachments in the Attachment Preview Mode provided by the tool. Types of Profile The software permits to convert Single or Multiple Profile/Identity configured in Thunderbird into multiple file formats. MBS File The MBOX Converter wizard also works with MBS files. It allows to convert MBS message, labels, and attachments into the desired file format. All Messages: Unread.mbs, Received, Pinned, Outbox, Sent, Draft, Spam, Deleted. Labels: Call Back, Funny, Important, Meeting Send reply, To Do, Valuable. MSF MSF is a Mail Summary file with the .msf file extension. This is an index file of Mozilla Thunderbird in which only headers and summary of emails are present. Note: MSF file does not contain any message body. Thus, it is recommended to browse the MBOX file. SBD SBD file is a Sub Directory file in Thunderbird. This file stores the email message in folder or directory format. So, to get the desired SDB data it is suggested to browse for the MBOX file while working with MBOX Converter tool. 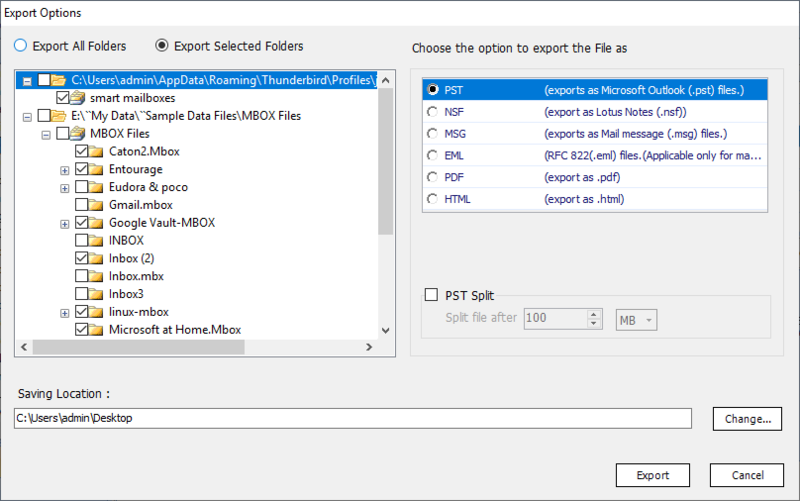 Once the MBOX files are exported to format, they can easily be accessed in any MS version. The users can easily import files to email client after the conversion of MBOX format to file format. One can easily implement MBOX to Conversion via MBOX Converter Software. The resultant file can be easily opened in the browser such as Google Chrome, Mozilla Firefox etc. File Mode: With File Mode, the software creates a separate file for each MBOX file. Folder Mode: The Folder Mode permits to merge multiple MBOX files into a single file. The requirements vary from one user to another user. So, considering the needs of all the users, the software is developed to export MBOX files to by creating single or multiple files. Create Single File: During MBOX Conversion to , the user can merge all the MBOX files in a single and create a common file. Create Multiple Files: One can create a different for each MBOX file. So, after the MBOX to conversion process, the user will be having multiple files for various MBOX files. For Example, if the user wants to convert 10 MBOX files then the software will create 10 separate files for each MBOX file. SysTools MBOX Converter Wizard provides different options to migrate MBOX files. The user can export MBOX file into various file formats such as in a hassle-free way. : One can convert multiple MBOX files in file format and then can access the resultant file in Microsoft application. : The output file is supported by various email clients such as Windows Live Mail, Express, Window Mail etc. : files are the individual mail file format used by MS . 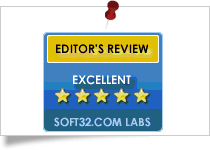 The tool easily migrates MBOX emails to file format as per the needs. 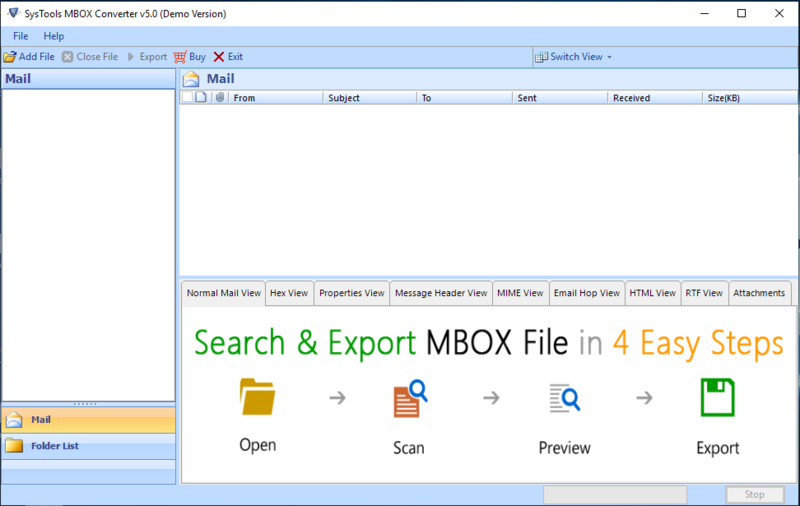 : To access MBOX file in email client, one can export MBOX files to file format. After that, simply open output file via email client. : To open MBOX files in a browser such as Google Chrome, Mozilla Firefox, etc., convert the MBOX file into file format. This makes it easily accessible in any browser. The users who want to switch from Apple Mail email client to , they can easily migrate their Apple Mail emails to Windows by converting them into file format. The software allows the user to convert single or multiple Apple Mail MBOX email files into format in just a few clicks. Auto Detect Email Client: With this option, the software is capable to auto-detect the Thunderbird’s default profile and then convert MBOX file to format. Moreover, the software also permits the user to select the MBOX supporting email client from the in-built list of email clients. Multiple Identities: The utility is capable to recognize MBOX files of all the configured profiles in Thunderbird email client and then convert them into . Orphan MBOX File: When a user needs to convert orphan MBOX into the desired file format, it may become quite a challenging task. But MBOX Converter software allows any user to work with orphan MBOX file and convert it into the required file format without any complications. In Eudora, emails are stored in MBX file format. Thus, most of the user face issues while switching from Eudora email client to as they are not able to find an instant and reliable way to perform MBX to conversion. But, with MBOX Migrator, the user can convert Eudora MBX emails into format without any inconvenience. MBX Attachments: If the user also wants to convert attachments associated with MBX files then he/she just has to place the attachments at the location where MBX file is stored and then the software will automatically fetch the attachments and will migrate them. SysTools MBOX Converter software is designed with various beneficial features to make it for the users to export multiple MBOX files to different file format. Now, if the user wants to open Entourage MBOX file in then he/she can opt for MBOX Migrator tool. This utility allows the user to migrate Entourage MBOX files data into file format without any data loss or security issues. One of the most commonly used web-based email client is Gmail. Sometimes, the user needs to access Gmail/Google Takeout files in the email application. Thus, to carry out this task, simply convert Gmail/Google Takeout MBOX files in file format via Google Takeout MBOX Converter wizard. However, if you wish to backup your Gmail data directly into , go for Gmail Backup software. In case of to MBOX conversion, the software allows to extract attachments from MBOX file in different folder. This enables users to easily save the MBOX attachments in a separate folder whenever required by converting MBOX emails to format. There is no requirement of any external email application for this task. Also, the tool ensures that none of the attachments get corrupted or lost during the extraction process. One can easily convert the selective emails from the MBOX file and export them into the desired file format. The software provides the Selective Export feature which permits the user to migrate data as per the requirements. Moreover, SysTools MBOX Converter also allows to extract attachments from MBOX file via migrating them to . One can also check/uncheck the folders while exporting MBOX file emails into format. Split Option: This option allows the user to split the resultant file into the desired file size while the MBOX conversion to . 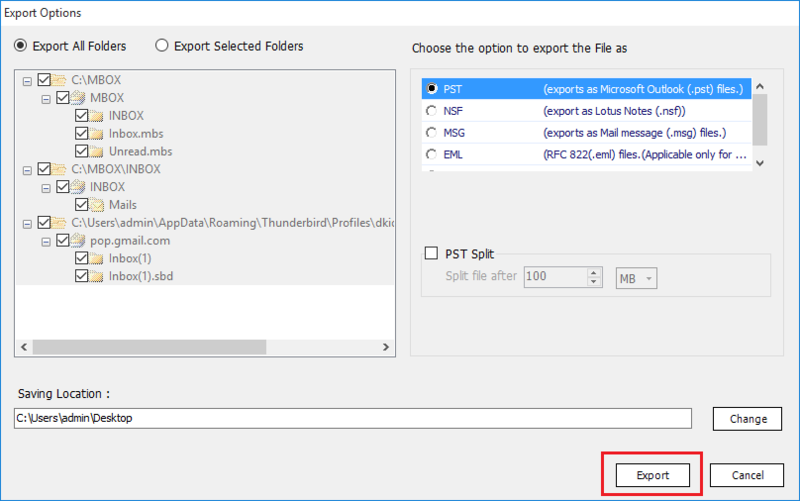 Split Option: With this option, one can easily split the output file into a particular file size at the time of MBOX export to format. While exporting MBOX files in format, the software provides the File Naming Option. With this option, one can save the resultant files by selecting the appropriate naming pattern. The software provides a variety of naming conventions such as Subject, DD-MM-YY, Cc, From, Auto Incremental etc. To migrate MBOX files mail into file format, the MBOX Converter software does not require the installation of application. The user does not have to install or configure Microsoft to perform MBOX to conversion. No application dependency issues are associated with the software. The MBOX Extractor is capable to filter out the MBOX files for scanning, from an assortment/variety of other file types. Moreover, the software also filters out the MBOX format from the selected folder storage on the system in a trouble-free way. SysTools MBOX Converter is compatible with Windows Operating system and its all the versions such as Windows 10/8.1/8/7/6 and the below editions. Additionally, the utility also supports both 32-bit as well as 64-bit version of the Windows Operating System. The Output file generated by software is compatible with all versions: 2019/ 2016/ 2013/ 2010/ 2007/ 2003/ 2000. Is the software capable to work with MBS/SBD/MSF/MBX files? 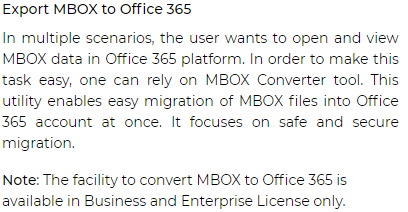 Yes, the MBOX Migration Software is capable to export MBS/SBD/MSF/MBX files in a hassle-free way. Step 8: Hit the Export button and MBOX Converter will migrate MBOX mailbox to preferred format. 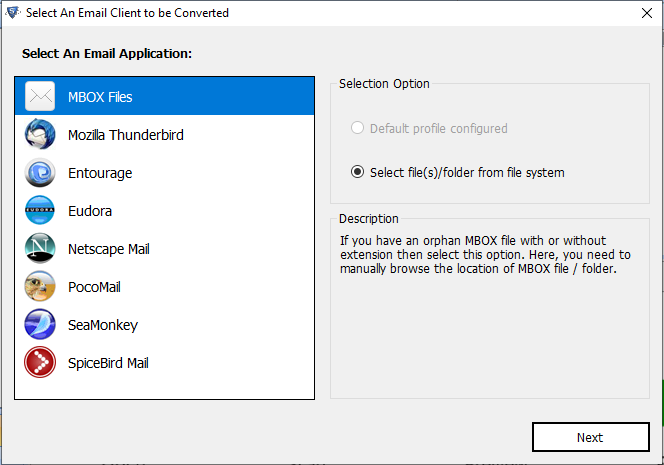 Does the software allow the conversion of orphan MBOX file into the file format? The MBOX Exporter tool is designed with robust algorithms and integrated with amazing features. One such feature is the conversion of orphan MBOX files in the file format. The user can easily convert the orphan MBOX emails into the desired file format via the software. Can I convert Entourage MBOX files into file format using MBOX Converter tool? 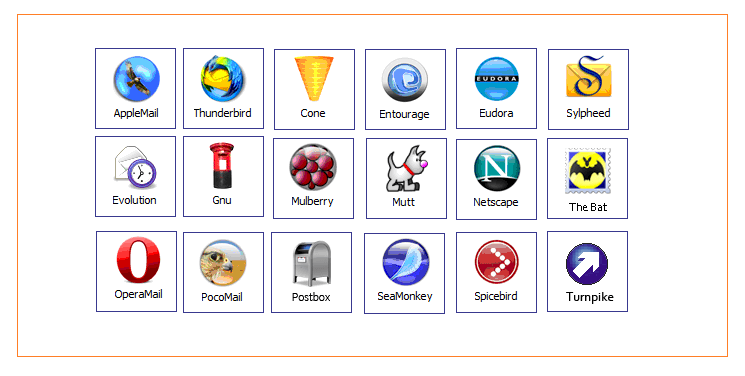 Yes, with SysTools MBOX Converter software, one can easily convert MBOX file of multiple email client such as Entourage, Eudora, Thunderbird, Mozilla SeaMonkey etc. into different file formats such as file format. Is there any data loss, security and formatting issues associated with MBOX Converter application during the export process? No, the software is designed with top-notch data protection and security algorithms. So, there is no chance of data loss and security breach while the conversion process. Moreover, the software maintains the formatting of MBOX files even after the conversion process. Can I recover MBOX file if I have permanently deleted emails? Yes, the MBOX Recovery tool recover deleted data from your MBOX file, as the software has scanning option, so it generally index the complete file with it structure (from signature to mail body). So not only in case of deletion but also you can recover MBOX file emails & restore it in healthy format. After testing MBOX converter tool, I can say that now I don't have to look for separate MBOX extractor if I need to either export MBOX files to or move them to my OE or create for the same. Thanks a lot for your efforts! We were having around hundred and fifty MBOX files of various employees and need to created respective files for each user. I must say SysTools MBOX converter wizard did this rightly for us. It's a smart MBOX mail exporter tool with commendable performance. I was in trouble to manage multiple MBOX files on my desktop. I tried all possible ways to use those orphan files but unable to do so. Then, one of my colleague suggested me to use SysTools MBOX Converter Software to export MBOX file to and manage all the data in . I must say this is the best option to extract MBOX attachments and emails, thanks to its team.